How I got this book: received it from the publisher through NetGalley and also pre-ordered it cause I couldn't resist owning a shiny copy! *Assassins battling it out to win freedom while something sinister is going on in the castle. EXCITEMENT AND FIGHTING AND MYSTERY AND ROMANCE! *Does anyone remember this Top Ten Tuesday post of my favourite characters back in 2010? Celaena Sardothien was already on it back then and reading the finished book now hasn't altered my opinion. Basically: awesome, strong female character, snarky, arrogant, flawed and very, VERY real. 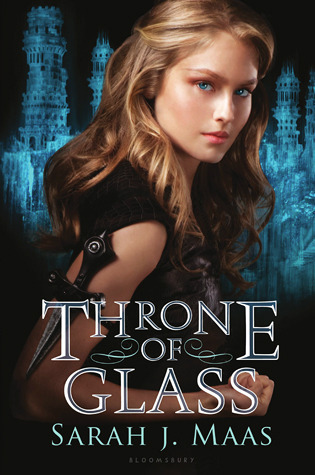 *I loved this novel back when it was on Fictionpress and Throne of Glass is the shiny, polished, even more amazing version of the story I fell in love with about 9 years ago. *So many characters to fall in love with! *Sarah J. Maas is an expert storyteller and once you pick this one up, you won't be able to put it down until the end. And not even then. *GAH, just read it already or pre-order it or something, I need people to talk about this novel with!! If you'd like to see me fangirl a bit more about Throne of Glass, check out my review on my personal blog Between the Pages! I heart this book so much. I thought the characters were great the story exciting. Loved it!!!! Isn't it great? I'm so glad Sarah stuck with it for ten years to get to today. Ahh, so good! Thank you! :) I hope you enjoy it as well!! I'll have to check it out! Sounds like it's just up my alley and I think it's so awesome that it got its start on Fictionpress! Kelly's review of "North of Beautiful"
Winner of the 2 Year Giveaway!